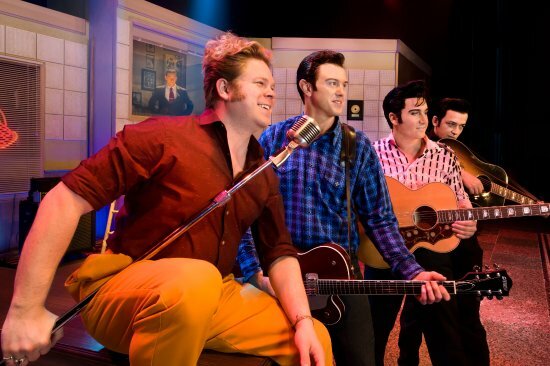 Million Dollar Quartet is one of the most celebrated music shows in Branson that light up the stage and will have you singing and dancing along with hits from legendary recording artists. The quartet will let you experience the jam session that marked the history of rock ‘n roll. You will hear songs that pay homage to the legendary recording session that brought together musical greats such as Elvis Presley, Jerry Lee Lewis, Johnny Cash, and Carl Perkins. The show presents a masterful style of music as you are treated to renditions of songs such as “Matchbox,” “I Walk the Line,” and “Hound Dog.” Their performance style of gospel, blues, and rock ‘n roll music is sure to appeal music lovers of all ages. This popular music show in Branson is an entirely new production of the Tony Award-winning musical from Broadway. Watch the legendary “Father of Rock ‘n Roll” Sam Philips (the host of one of the most famous recording sessions of all time) as he brings some of music’s most iconic and legendary artists together for a night that would go down in the history books. Throughout the musical production you will hear some of the biggest hits of all time including “Whole Lotta’s Shaking’ Going On,” “Fever,” “Blue Suede Shoes,” “Who Do You Love?,” “Ghost Riders,” “Great Balls of Fire,” and “Sixteen Tons,” amongst some of the most amazing entertainment productions to be found in the country. Million Dollar Quartet is not simply a tribute show, it’s a loving homage to four of popular music’s brightest stars in their time. This music show in Branson will captivate audiences with brilliant presentation that depicts a phenomenal moment in the history of rock ‘n roll – the jam session that brought together four music icons. In addition to these phenomenal legendary music icons, the show features a supporting cast of other performers that shared this memorable event, including Elvis’ girlfriend, Dyanne, and Carl’s brother, Jay. It was in 2015 that the Welk Resort Theatre of Branson hosted the all-new, Broadway production, Million Dollar Quartet. Inspired by an incredible true story, this great music show in Branson relives one magical night – an impromptu jam session with Elvis Presley, Johnny Cash, Jerry Lee Lewis, and Carl Perkins. Together, on this one night performance show, the musical hits of the four legendary music icons that have spanned decades and generations are right here ready to excite everyone as Million Dollar Quartet performs on stage. Featuring a set of the greatest rock 'n' roll, gospel, R&B and country hits from the legendary music icons, Million Dollar Quartet captures the infectious spirit and melodious sounds of that singular moment when four of the music industry's most talented musicians, all in their creative prime, came together for one of the most memorable nights in music history. If you are looking for some of the best music shows in Branson, come see the Million Dollar Quartet and experience the jam sessions that marked the history of rock ‘n roll music.